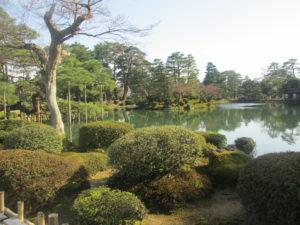 Kenroku-en (Six Attributes Garden), located in Kanazawa, Ishikawa, Japan, is an old private garden. 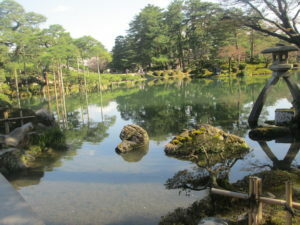 Along with Kairaku-en and Koraku-en, Kenroku-en is one of the Three Great Gardens of Japan. 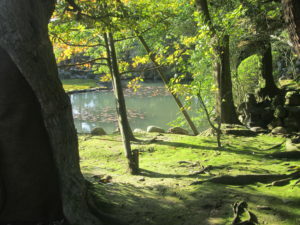 The grounds are open year-round during daylight hours and famous for its beauty in all seasons; an admission fee is charged. 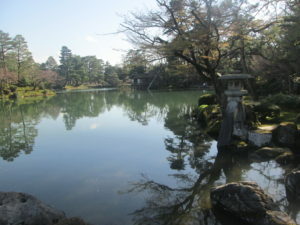 Kenroku-en was developed from the 1620s to the 1840s by the Maeda clan, the daimyōs who ruled the former Kaga Domain. 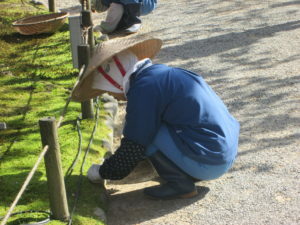 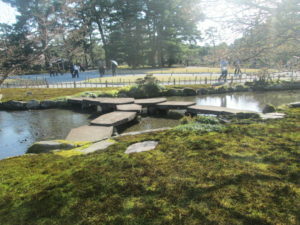 While the date of initial development of the garden that would be become known as Kenrokuen is rather unclear, one version of the garden’s origins can perhaps be marked by the completion of the Tatsumi water channel in 1632 by Maeda Toshitsune, the third daimyō of the powerful Maeda clan and ruler of the Kaga Domain from 1605 to 1639, as this feature would be later incorporated into creating the garden’s twisting waterways in 1822. 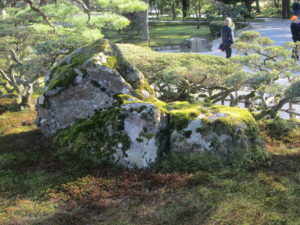 Conversely, other versions of the garden’s inception “is said to have originated when the 5th daimyō Tsunanori. 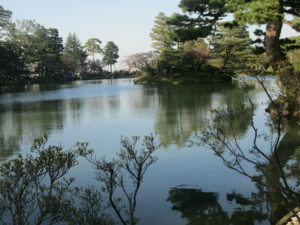 1645–1723] built [in 1676] the Renchiochin house on the slope facing the [Kanazawa] castle, and gave its garden the name Renchitei”, also spelled Renchi-tei, which means “lotus pond”. 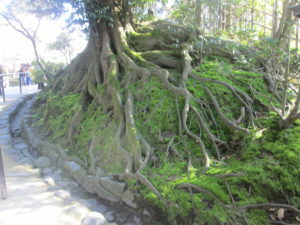 1,200 years ago a peasant named Togoro stopped to wash his potatoes at the well. 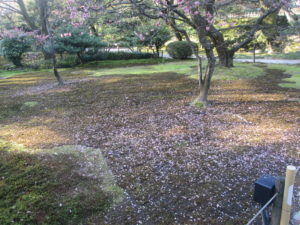 Suddenly, flakes of gold began to bubble up from the well, giving Kanazawa – meaning ‘Marsh of Gold’ – its name. 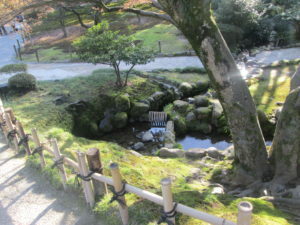 Water from the well runs to the purification basin at the nearby Shinto shrine, and many people come to the Sacred Well for water for the tea ceremony. 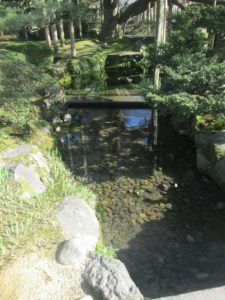 The Shigure-tei teahouse – constructed in 1725 – miraculously survived the fire of 1759, and it offers evidence that not only was the tea ceremony present before the fire, but more importantly so was the culture associated with this elaborate ritual as it had a significant effect on garden design. 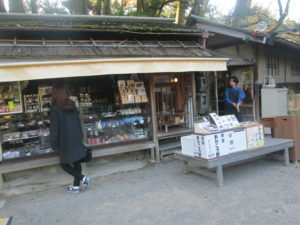 Following the fire, the teahouse continued to be used and was completely restored during the Meiji period. 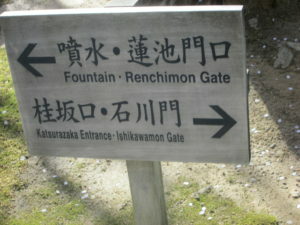 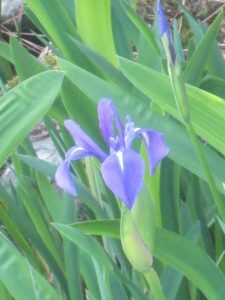 It can still be seen today in the Renchitei section of the garden. 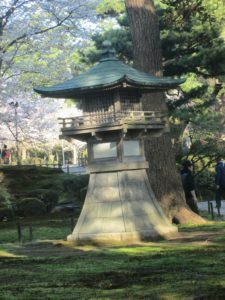 Another object that existed in or around the garden before the fire of 1759 was the Kaisekito Pagoda, which is currently situated in Kenrokuen Garden on an island near the center of Hisago-ike Pond. 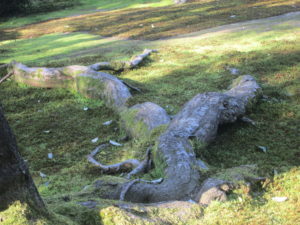 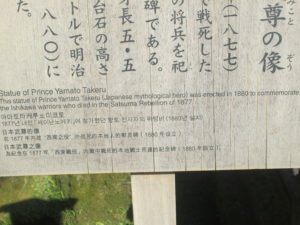 Not only is this object of considerable interest due to the theories which suggest its origin, but it also requires extra consideration due to the fact it “was erected by the third lord Toshitsune” who lived from 1594 to 1658, as it provides evidence that perhaps it predates the initial creation of Renchitei Garden. 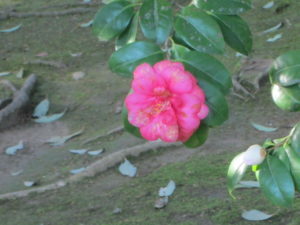 Of course, this depends upon ones interpretation regarding both when the garden was initially created, along with the two theories regarding its origin. 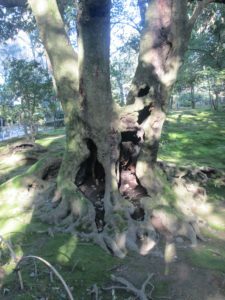 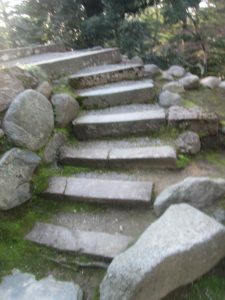 The first theory suggests it was formerly part of a “13-tiered pagoda that was once in the Gyokusen-in garden in Kanazawa Castle”. 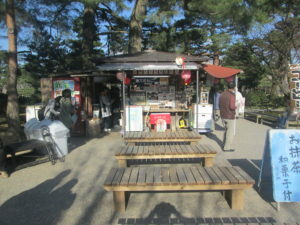 The second theory is a bit more interesting than the first, as it suggests the pagoda was “brought back from Korea by Kato Kiyomasa when he came back from a military incursion there, and that it was presented to Toyotomi Hideyoshi, and then passed on by him to the first lord [Maeda] Toshiie”. 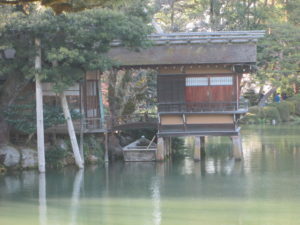 Since these military incursions by Kato Kiyomasa probably took place between 1592 and 1598, and as Hideyoshi died in 1598, one can assert that if the second theory is true, then the pagoda probably entered Japan and into the hands of Maeda Toshiie between 1592 and 1598. 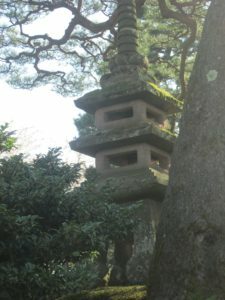 Moreover, both theories regarding its origin could be true, which one could argue would lead to a third theory behind the pagoda’s origin. 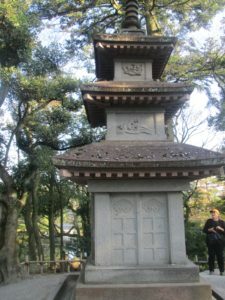 Perhaps, Maeda Toshiie received from Hideyoshi a 13-tiered pagoda, placed it in Gyokusen-in garden in Kanazawa Castle, and a subsequent daimyo placed the pagoda where it stands today in its current form. 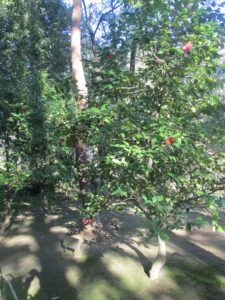 However, as there isn’t any evidence suggesting this third theory, this claim cannot be substantiated. 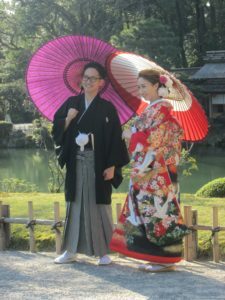 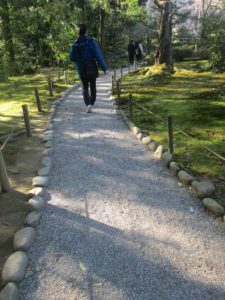 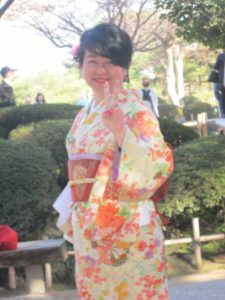 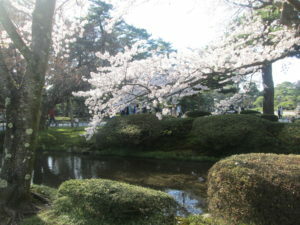 The garden is located outside the gates of Kanazawa Castle where it originally formed the outer garden, and covers 114,436.65 m² (over 25 acres). 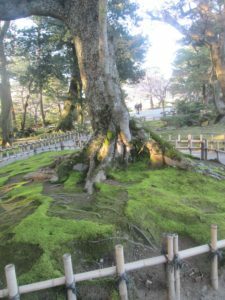 It began in 1676 when the 5th daimyō Maeda Tsunanori moved his administration to the castle and began to landscape a garden in this vicinity. 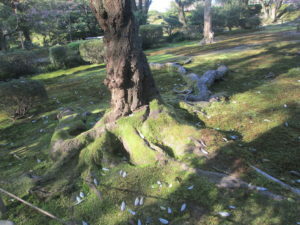 This garden was, however, destroyed by fire in 1759. 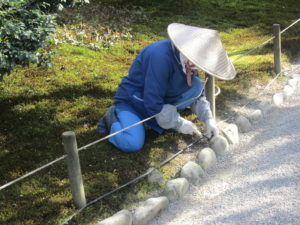 The garden restoration was begun in 1774 by the 11th daimyō Harunaga, who created the Emerald Waterfall (Midori-taki) and Yugao-tei, a teahouse. 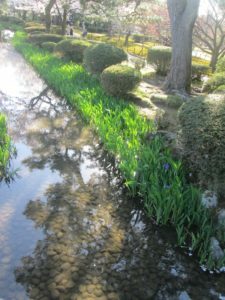 Improvements continued in 1822 when the 12th daimyō Narinaga created the garden’s winding streams with water drawn from the Tatsumi Waterway. 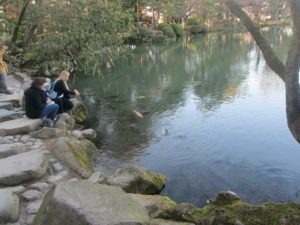 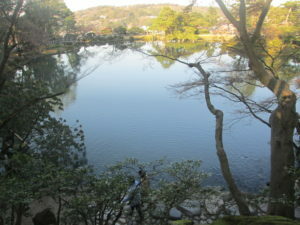 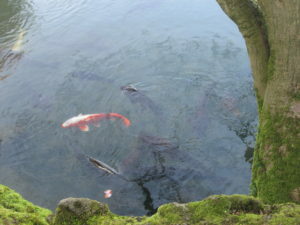 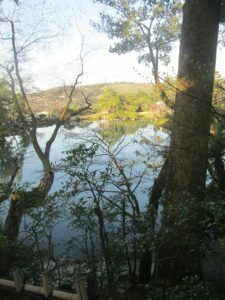 The 13th daimyō Nariyasu subsequently added more streams and expanded the Kasumi Pond. 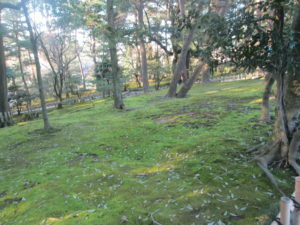 With this, the garden’s current form was complete. 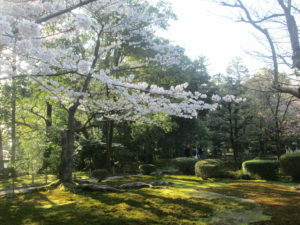 The garden was opened to the public on May 7, 1874. 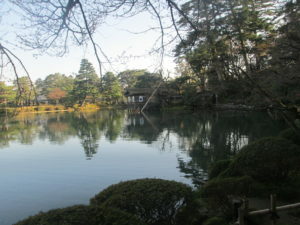 The garden was named by Matsudaira Sadanobu at the request of Narinaga. 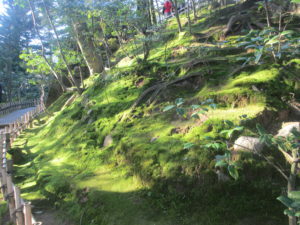 Its name was derived from the “Chronicles of the Famous Luoyang Gardens”, a book by the Chinese poet Li Gefei, and stands for the six attributes of a perfect landscape: spaciousness, seclusion, artifice, antiquity, waterways, and panoramas. 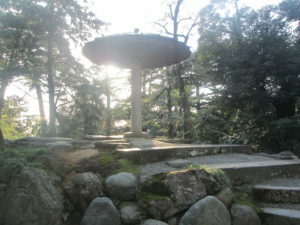 The oldest fountain in Japan, operating by natural water pressure. 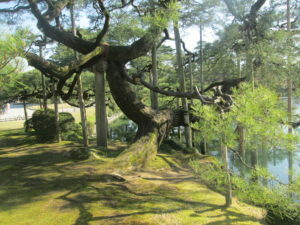 Karasaki Pine, planted from seed by the 13th lord Nariyasu from Karasaki, near Lake Biwa. 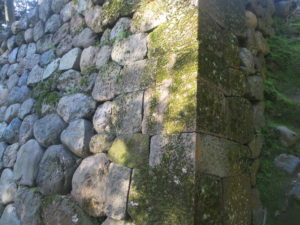 Kotoji-tōrō, a stone lantern with two legs, said to resemble the bridge on a koto. 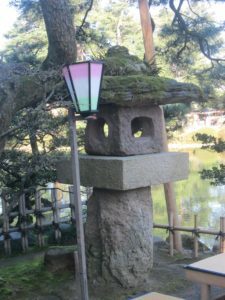 This lantern is emblematic of Kenroku-en and Kanazawa. 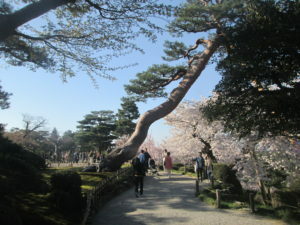 In winter, the park is notable for its yukitsuri — ropes attached in a conical array to carefully support tree branches in the desired arrangements, thereby protecting the trees from damage caused by heavy snows. 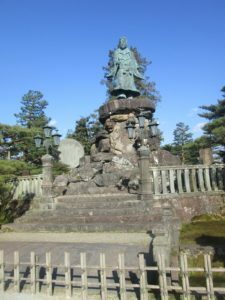 The Statue of Prince Yamoto Taskeru (Japanese mythological hero) was erected in 1880 to commemorate the Ishikawa warriors who died in the Satsuma Rebellion in 1877. 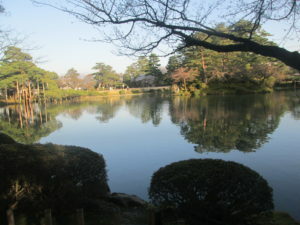 In 1837 this pond’s area was expanded to 5,000 m2. 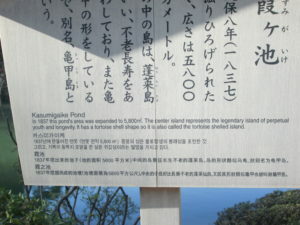 The center island represents the legendary island of perpetual youth and longevity and has a tortoise shell shape so is called tortoise shelled island.